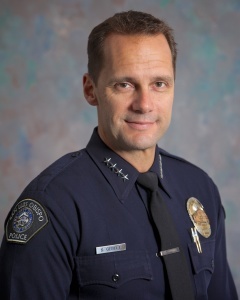 San Luis Obispo City officials agreed Thursday to pay police Chief Steve Gesell a $120,000 severance to end his employment with the city as of May 29. City manager Katie Lichtig placed Gesell on paid administrative leave on May 8 while she and city attorney Christine Dietrick negotiated a settlement with Gesell. Lichtig said she and Gesell had fundamental differences about the appropriate roles and responsibilities of a police chief in a press release. According to Gesell’s employment agreement, if he is terminated for reasons other than misconduct, malfeasance or criminal negligence, he is due a severance of at least six months of his salary and benefits which equals $132,532. As part of the settlement agreement, Gesell and city officials agree not to disparage the other. San Luis Obispo police Capt. Chris Staley will remain as acting chief while the city begins the process of recruiting a new police chief. If it’s in his contract, then he deserves every cent. Maybe Anthony Batts wants a new job? Happy Town has lots of Happy Dollars to give away. The public trough is paved in gold. What an absolutely disappointing thing the San Luis Obispo City council and Mayor Jan Marx have done, giving away our money to hide what? Shame on you, this will not be forgotten. In the real world we have “at will” employment contracts. Employee or employer can end the relationship at any time. Government, of course convoluted the issue resulting in nearly impossible circumstances require and huge costs to get rid of someone. …and to think that since January (shortly after the travelgate story broke) Steve has been testing for the Chief’s job in Chico and is now a finalist. To think that he has boned the SLO taxpayers for 120,000 bongos is sickening. Hey you folks in Chico …. WTF are you thinking? Stop the train wreck before entering the curve !!! What an unbelievably sad quagmire. Think of our successors 100 years from now. Newspapers will be obsolete; but through some current method of communication, they will learn the history of their predecessors. And when they do, they will think it is too farfetched to be true. Now SLOPD will do just like PRPD, PBPD and GBPD has done. A nation wide search with the top candidate and best suited for the position being hire. Let me guess acting chief Capt, Chris Stanley. If the people really care thay will get actively involved with the selection of a new police chief. We have all discovered what are in these very lucrative contracts only after the payoffs have been made. It’s time for the people to say no more of these separation gifts.